Svalbard warming revisited; 2.9oC warming instead of 4.4oC from 2003 to 2007 ? Svalbard Airport and Longyearbyen May 7, 2007, looking east. The ice free fjord Adventbay is seen to the left, extending to the mouth of the major valley Adventdalen. The official meteorological station at Svalbard Airport (28 m above sea level) is located at the blue dot. The meteorological station on Gruvefjellet (467 m above sea level) is located at the red dot. The village Longyearbyen is seen about halfway between the two dots. The satellite receiving station Svalsat is seen on the mountain plateau in the foreground. The mean annual air temperature measured at the official meteorological station at Svalbard Airport (78.25o N, 15.47o E, central Spitsbergen; see photo above) has increased 4-5 degrees Celcius since the beginning of the present century, as fact often referred to in discussions on global warming. Click here, here, here and here to see a few examples, although cautionary voices have also been raised. The mean annual air temperature change from 2003 to 2006 (-6.1 to -1.7oC; an increase of 4.4oC) has been described as considerable and have attracted widespread interest. In addition, also the contemporary lack of sea ice on the fjords in western Spitsbergen since the winter 2005/2006 has been seen as the result of anthropogenic global warming. An analysis of the background for the absence of winter sea ice on fjords in western Spitsbergen has been published by Cottier et al. (2007)... In the years leading up to 1940, fjords in western Spitsbergen may also have experienced a period without winter ice (Ahlmann 1947). Click here to read more about this. The effect of topography on local meteorological values (temperature, wind, precipitation, etc.) it is well known among field meteorologists. To obtain information on regional meteorological values for Central Spitsbergen, the Department of Geology at UNIS therefore in August 2001 established a meteorological station on the mountain Gruvefjellet, near Longyearbyen (see photo above). The specific purpose of this station is to obtain data useful for evaluation of permafrost conditions and snow avalanche danger in Central Spitsbergen. 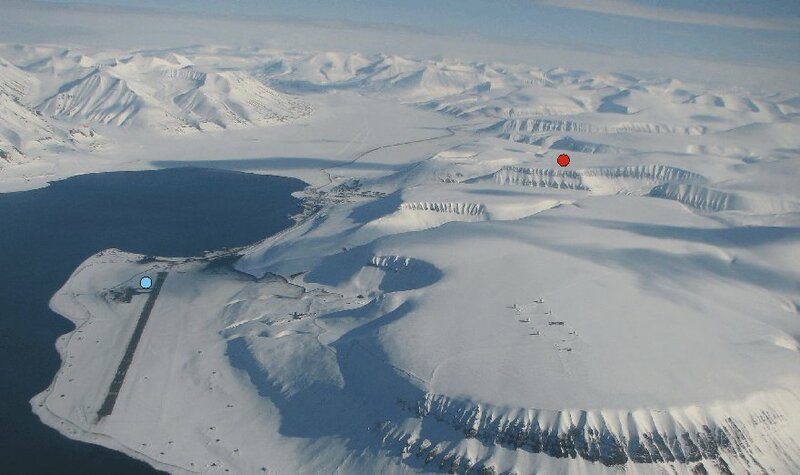 Before establishing the meteorological station at Gruvefjellet, is was speculated that the station at Svalbard Airport would be affected by channelling effects of wind along the major valley Adventdalen and that air temperatures from this station might be affected by the nearby fjord (see photo above). The station on the mountain plateau Gruvefjellet was estimated to provide wind data less affected by topography, and temperature data less affected by the fjord. In the diagram below, the monthly temperature values for both stations (Svalbard Airport and Gruvefjellet) is shown together. Diagram showing monthly air temperature (upper panel) as measured at the official meteorological station at Svalbard Airport (blue graph) and at the Gruvefjellet meteorological station (red graph), since 2001. The blue and red dots show the mean annual air temperature as recorded by the two stations. The lower panel (green graph) shows the average monthly temperature difference between the two stations (Svalbard Airport minus Gruvefjellet). During the winters 2005-06, 2006-07 and 2007-08 the sea surface near the Svalbard Airport meteorological station remained, in general, free of sea ice, and the vertical temperature lapse rate therefore remained high throughout the winter. The return of sea ice from the winter 2008-09, however, is characterized by the return of periods with frequent temperature inversions, and lower winter lapse rates. Time is shown along the x-axis as Date/Month/Year. The Gruvefjellet meteorological station was established in August 2001. Last month shown: February 2011. Latest update: 23 March 2011. The mean annual air temperature for the meteorological stations at Svalbard Airport and Gruvefjellet show parallel development in 2002, 2003, and 2004. The lower temperature at Gruvefjellet is caused by the higher altitude (467 m versus 28 m above sea level). From the winter 2005/2006 a stable sea ice cover on the nearby fjord has been lacking, and it has been essentially absent during the winters 2006/2007 and 2007/2008. Concurrent with the absence of winter sea ice, the recorded winter air temperature increases; most at the meteorological station at Svalbard Airport and less so at Gruvefjellet. The summer air temperature is essentially stable during the whole observation period. The change in mean annual air temperature 2002-2007 therefore is mainly caused by increasing winter temperatures, while summer temperatures essentially have been stable. The mean annual air temperature increase 2003-2006 at Svalbard Airport was 4.4oC, while it was 2.9oC at Gruvefjellet. Since 2006, however, the mean annual air temperature has again decreased somewhat. Heat release from open water in the nearby fjord presumably affected the local air temperature measured at Svalbard Airport, as this station is located near the coast. Due to greater distance from the coast and greater altitude the meteorological station at Gruvefjellet was less affected by the open water, and therefore presumably provide better insight into regional Svalbard meteorological changes than the station at Svalbard Airport. The high 4.4oC increase in air temperature 2003-2006 recorded by the official meteorological station at Svalbard Airport must therefore be considered partly caused by the coastal location of this station, being affected by heat release from the nearby open water. The smaller 2.4oC increase in mean annual air temperature recorded at Gruvefjellet 2003-2006 in all likelihood represents a more realistic value for the real temperature increase in the Svalbard region during this period. If winter sea ice forms on the fjord in the coming winters, the mean annual air temperatures of the two meteorological stations will presumably again converge and show parallel development. The effect of the presence or absence of winter sea ice is clearly illustrated by the green graph in the lower part of the diagram above. When winter sea ice is present, cold and therefore dense air may accumulate in the valleys and over the ice covered fjord during calm periods. By this temperature inversions will be established, with air temperature actually increasing with altitude (temperature inversion). Months with frequent temperature inversions are indicated whenever the temperature difference between Svalbard Airport and Gruvefjellet (green graph) approaches zero or even decreases to negative values. Over the period 2002-2006 situations with little or no sea ice cover on the fjord and temperature inversions have decreased in frequency, and the meteorological station at Svalbard Airport has always (monthly values) been warmer than the station on Gruvefjellet. From 2006, however, the the trend has again been towards more and more sea ice, and the mean annual air temperature has again decreased somewhat. The return of solid sea ice from the winter 2008-09 is seen to be characterized by the return of periods with frequent temperature inversions, and lower winter lapse rates (see diagram above). Summing up: Being a Norwegian Meteorological Institute station, the meteorological station at Svalbard Airport is run in a very professional way. The fact remains, however, that the location of the station might be less than optimal to register regional air temperature changes in this part of the Arctic. The changes documented by this particular station presumably represent a mixture of real regional changes, and local effects due to changes in the sea ice cover. Several other meteorological stations in the Arctic may find themselves in a similar situation. To obtain reliable measurements on regional changes in Arctic air temperature meteorological stations should presumably be located inland, not near the coast. Click here, here, here, here, here, here, here, here, and here to see modern as well as historical examples of this. Click here and here to read an analysis of the background for the recent absence of solid winter sea ice on fjords in western Spitsbergen. This analysis has been published by Cottier et al. (2007). Click here to access daily values from the Svalbard Airport meteorological station. The service is free, but you will have to register. Click here to see hourly observations from the Gruvefjellet meteorological station. Click here to read about the Longyearbyen snow avalanche research project (Cryoslope Svalbard). Click here to jump back to the Urban Heat Island main page.